Prefabricated flexible geomembranes are increasingly being used around the world for irrigation canal and reservoir liners in place of traditional clay lined or concrete systems. Clay lined systems typically only reduce the amount of seepage of valuable irrigation water into the groundwater. Concrete systems are very expensive and subject to cracking and leaks. Using a properly selected geomembrane for a canal or reservoir liner can significantly reduce water loss due to erosion of embankments and water seepage. This helps provide valuable water savings and irrigation efficiencies in agricultural and horticultural applications. 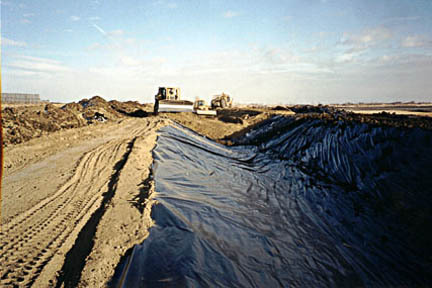 Layfield Environmental Containment provides a selection of highly flexible, durable, prefabricated geomembrane liners. Our Enviro Liner® 3000 is a good choice of economical grade geomembrane for shorter-term exposed applications. Both our Enviro Liner® 4000 and 6000HD are excellent choices for mid to long-term exposed applications. We can also custom fabricate our Enviro Liner® geomembranes into large panels to reduce your installation time and costs.